The Philip Kingsley Tricho Complex is a daily hair supplement inspired by a combination of vitamins and minerals prescribed at the Philip Kingsley Trichological Clinics. Developed by the brand's expert trichologists to provide extra daily nutritional support to your hair, the food supplement blends a cocktail of vitamins and minerals that may help contribute to the maintenance of normal, healthy hair. Ideal for those looking for their best hair quality and condition, the tablets combine a selection of key nutrients, including Iron, Biotin, Pantothenic Acid and Selenium. Take two tablets daily, one with breakfast, one with lunch. After 4 months, reduce your dose to one tablet per day in order to maintain optimum levels. Do not exceed recommended daily intake. Take with water, immediately after food. 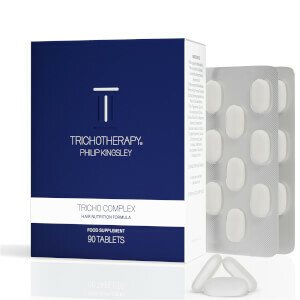 We recommend taking Tricho Complex for a minimum 12 weeks.